The State Department is spending $400,000 on a camel statue for the US Embassy in Pakistan. The State Department is planning to spend $400,000 in taxpayer funds to buy a sculpture for the new American embassy being built in Islamabad, Pakistan, according to contracting records. 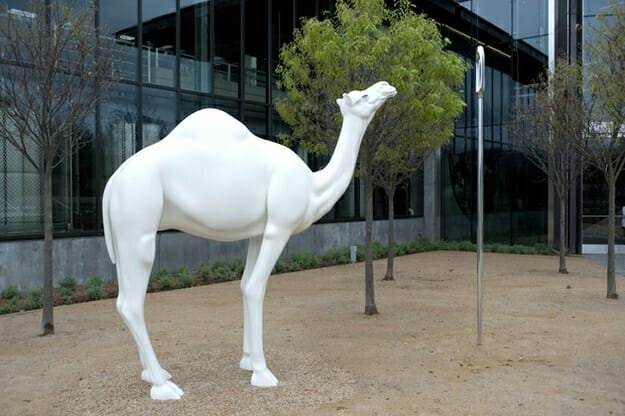 The work, by noted American artist John Baldessari, depicts a life-size white camel made of fiberglass staring in puzzlement at the eye of an oversize shiny needle — a not-so-subtle play on the New Testament phrase about the difficulty the wealthy have in entering the kingdom of heaven. In a statement, State Department press spokeswoman Christine Foushee said the proposed purchase comes from the department’s “Office of Art in Embassies.” In new construction projects, she said, a small part of the total funds, about 0.5% , is spent on art purchases. There are no wild Dromedary camels in Pakistan.